Enjoy the top 3 famous quotes, sayings and quotations by Susan McCutcheon. Today, the lay midwife is a response to a growing home-birth movement. In my own community most physicians have decided to withhold prenatal care from the home-birther. This is judgmental and vindictive. These doctors have decided that home birth is not safe, and by withholding prenatal care they are doing their best to make sure it is unsafe. 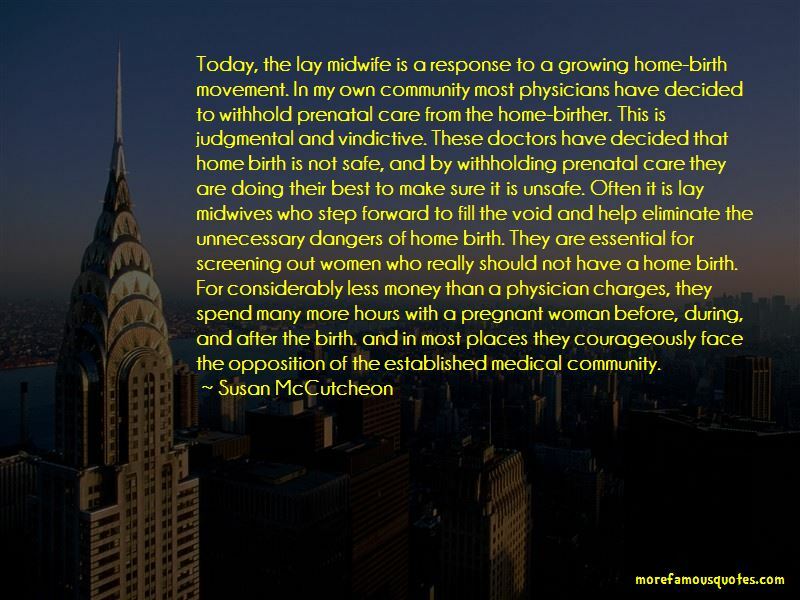 Often it is lay midwives who step forward to fill the void and help eliminate the unnecessary dangers of home birth. They are essential for screening out women who really should not have a home birth. For considerably less money than a physician charges, they spend many more hours with a pregnant woman before, during, and after the birth. and in most places they courageously face the opposition of the established medical community. “Drugs and medical technology can be enormously beneficial when used to take care of real complications, but too often they are abused when applied to women birthing normally. These women are thus subjected to unnecessary risks. The key to this problem is informed consent, an ideal too seldom realized. 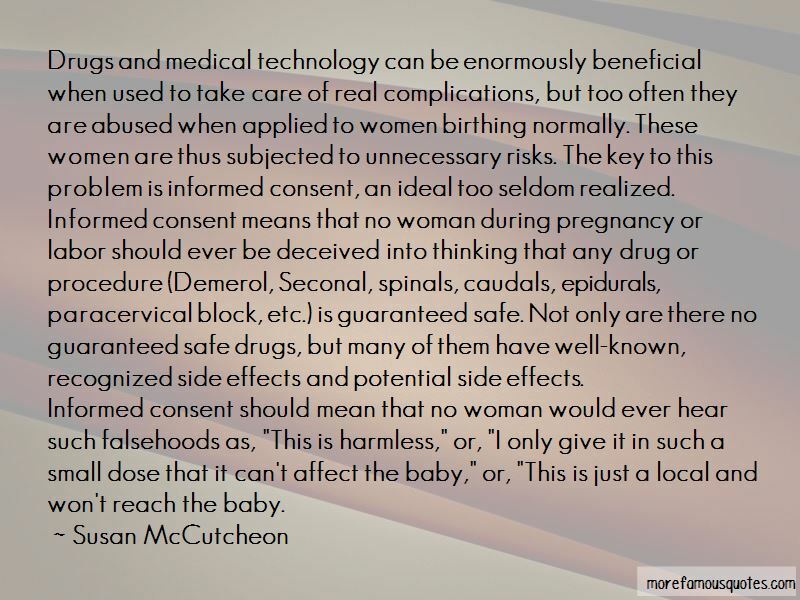 Informed consent means that no woman during pregnancy or labor should ever be deceived into thinking that any drug or procedure (Demerol, Seconal, spinals, caudals, epidurals, paracervical block, etc.) is guaranteed safe. Not only are there no guaranteed safe drugs, but many of them have well-known, recognized side effects and potential side effects. 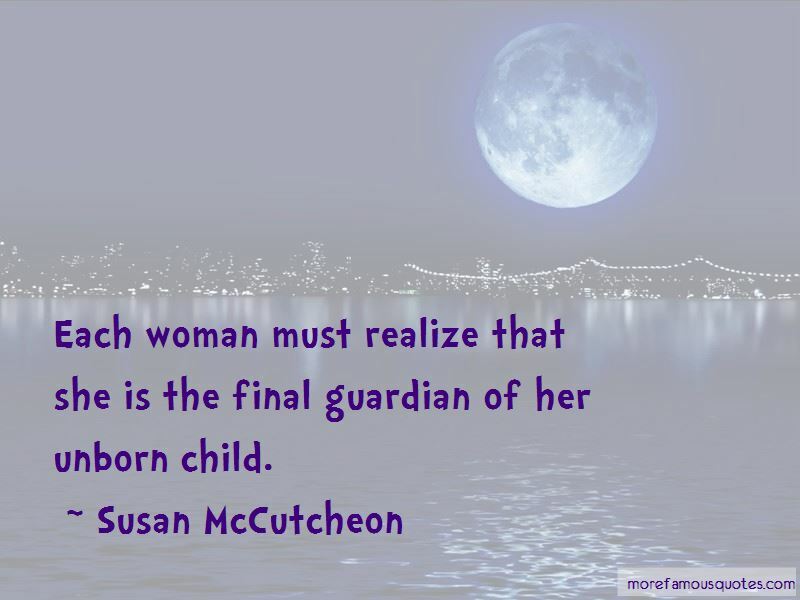 Want to see more pictures of Susan McCutcheon quotes? Click on image of Susan McCutcheon quotes to view full size.